I’d like to say that my love of thrift shopping stems entirely from eco-friendly, frugal, and charitable intentions, but I have to admit: it’s also just really fun to hunt for treasures in places where every individual piece feels one-of-a-kind. My home region, the Pioneer Valley of Western Massachusetts, is rich with thrift shops, antique stores, and places that sell creatively up-cycled and refurbished goods. With a large student population and a culture that generally embraces a low-waste approach to living, locally-made goods, and a good old New England bargain, there are a lot of second-hand options to choose from. We have all the usual nationwide thrift stores—Savers, Goodwill, Salvation Army—and there’s always Craigslist, local “buy nothing” groups, swap shops at transfer stations, and tag sales. There are a few special places, though, that I find myself coming back to when I’m looking for something specific or I want to chat with the shopkeeper. So, here are my favorite go-to stores in the Valley when it comes to buying things that aren’t quite new. I’ve included as many other stores for each category that I’m aware of. Some of these stores fall under the “thrift store” heading, while others are a little more in the vintage or up-cycled camp. I haven’t been to them all, and welcome suggestions for additions! If you live in the Noho area and shop second-hand, you’ve probably been here. The small store has a rapidly-cycling selection of clothes that range from basic brands for a few dollars to some high-quality (and slightly higher-priced) gems carefully selected by staff. The store and staff are just plain fun, hosting events and special sales on a regular basis. If you want a thrift store you can walk into and find something totally different every week, this is a go-to. Plus, proceeds benefit the local Cancer Connection nonprofit. Another charity-supporting store I love is the petite—but soon-to-expand!—Hospice Shop in Amherst. They have friendly volunteer staff, a cozy atmosphere, and a well-organized stock. In fall of 2018 (Sept. 4) they’ll be reopening their store in a larger space with much more parking, which will be a boon to the Amherst community. Right now their small storage room gets overwhelmed with donations and they’re excited to provide more inventory. This independently-owned consignment store has women’s clothes to suit every budget and an owner with a warm and outgoing personality. If you’re looking for designer brands, elegant evening wear, or some dressier work items, you’re likely to find them here. I found that her stock had a little more pizzazz than other local second-hand stores. The door is hidden around a corner, but head down the stairs and you’ll find a never-ending basement labyrinth of old furniture and antiques. They’re hanging from the ceiling, stacked high up the walls, and hidden in rooms you’re not sure if you’re allowed to enter (don’t worry, you are). The chatty, sweet owners attend estate sales regularly, and the best way to find out about hot items (e.g. mid-century modern pieces, rustic wood tables) is to follow them on Facebook for their daily updates. The best stuff gets snapped up quickly! Prices vary depending on the popularity of the style. This isn’t a thrift store, but if you’re looking for colorful, unique, up-cycled home goods and furniture, it will make you salivate. It’s a delightful mash-up of small vintage items, new locally-made goods, and larger furniture pieces curated and/or created by local Justin Brown. He’s known for his “furniture monsters“—eclectic storage pieces assembled from old drawers, shelves, and cabinets that are then painted in funky colors and expertly distressed. This is the place to go for a special, one-of-a-kind addition to your home, or even just a small gift. Exploring this store is like taking a time machine back to the 40’s, 50’s, and 60’s and being able to touch things that you, your parents, or grandparents had in their homes or their toyboxes when they were young. Except, here, you can still buy them. Nostalgia abounds in an unusual blend of vintage hardware, stationary, toys, and small household items along with products made (often upcycled) by local artisans. If you’re a DIY-er yourself, you may find just the right metal clasp, knick-knack, or mid-century topo-map of your town to complete your project. It’s called Hens and Chicks for a good reason—they have baby gear, clothes, and toys for all ages of children, but they’ve got a surprisingly well-stocked selection of clothes for mom, too, in maternity and regular sizes! The children’s items are in good condition and fairly priced—an important factor to consider for fast-growing tots and kids. 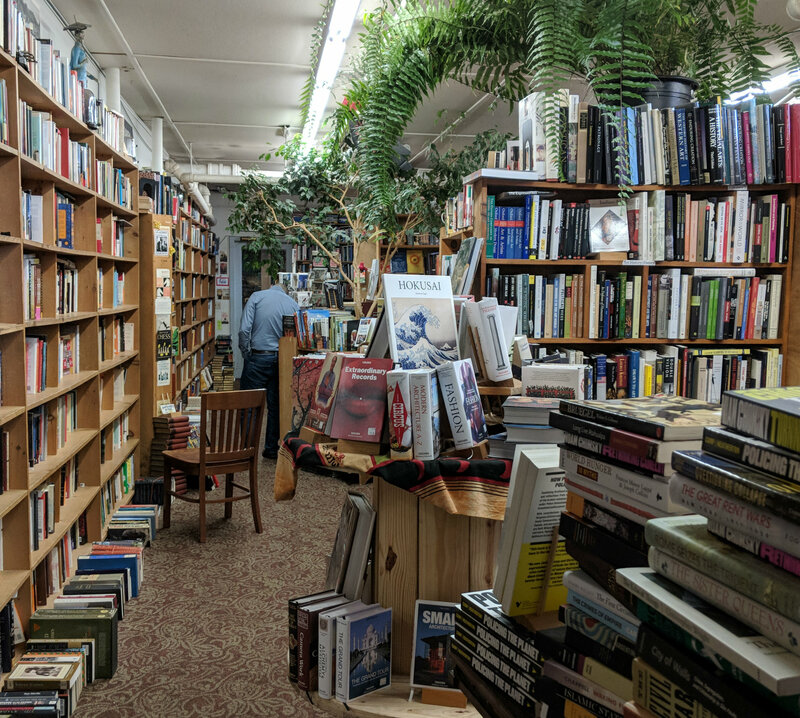 Maybe I have a soft spot for stores that are off the beaten path and make you feel like you’re inside a maze, but this bookstore is totally worth the trip. It’s right off the bike trail, too! You’ll find shelves of non-fiction reading to satisfy your intellect, but don’t worry—they carry novels and literature, too. Their motto is “Books You Don’t Need in a Place You Can’t Find,” and I’ve seen it on bumper stickers in places as far away as Los Angeles. That’s how special this place is. It’s tucked away in an old, red multi-story gristmill with views of the Saw Mill River, and features two restaurants, the aforementioned books, and the occasional local music event. Right next door are Turn it Up! (used and new music) and an art gallery. Come for the books, stay for the craft beer and Warm Brown Rice Salad.